Can you be satisfied with “do what you can”? All of my life I’ve been a “do what you can,” as-much-as-you-can soul. I never fancied disappearing because I wanted to make a positive impact and I thrive on making a difference. That’s my name Kelly, “Warrior.” On the other hand, I want to get away from some things. I get tired. Tired from the battle. Tired of pain. Since May 2009, we’ve laughed about my inability to multitask with a blog. I guess I was supposed to be able to travel or work on projects and still blog away. 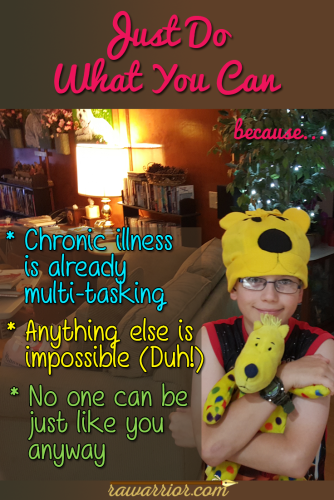 But living with rheumatoid disease is already multi-tasking, so I failed miserably at that. Many of you now know as I fought the battle of my own rheumatoid disease and for better care for all of us that I was also managing another battle. Sometimes – for about 5 minutes – I think I can manage it. And then I can’t move my arms to change my shirt for 3 days… And then I’m working for a week on an important blog post, and some big case-related event just takes over. And that blog post is still sitting in my Mac – 4 months later. Just do what you can. Duh. The counselor treating me for PTSD says it’s okay to just do what you can do… Well, duh. Of course I would say that to someone else. To my kids, or to you. But it’s my nature to try to do everything and please everyone. Foolish. Wrong. And impossible. Perhaps all this will help change to my flawed nature to try to do too much. Do you only change when you have no choice? Maybe I will finally be able to be content with “just do what I can do” and ignore the “clowns and liars” who will never be satisfied anyway. If you just do what you can do, what about your passion? “If I could light the world up for just one day”! My passion is to bridge the gap in both directions between experiences of PRD (people with rheumatoid disease) and those who take on aspects of their treatment (doctors, nurses, researchers, pharma, government agencies…). We’ve made big strides and the gap has gotten smaller. But there’s still much to do. And now, for me that gap has gotten very personal as my RD has been made a significant part of this protracted legal case. And so the battles overlap. It is unthinkable for someone who knows better to accuse you of malingering – moments after you struggled to stand up from a toilet. I hope your RD has never gotten that bad in your knees, hips, or ankles, but I know for some of you it has. Thankfully, good doctors have provided medical and moral support to help me face this too. Can vile lies or a vile disease stop my passion? No. This fire cannot be put out, though I move slower. Every day I am reading research on my phone and daily discussing studies with KB. There’s so much to learn and do. There’s so much I want to write about for you. But I’m just doing what I can. What’s your passion? Can it burn its way through whatever threatens to stop it? I wish I could talk freely with you about the madness involved in our legal situation, but that will have to wait until the case is over. Meanwhile we face a charade (this song is perfect) that puts Roo at risk and costs us in several ways. I’ve given a lot for him, but I’m not the only one. Who could imagine friends that would take us into their home for over two years? Somehow – All things work together for the good to those who love God and are called according to His purpose. It might not seem so. But I believe it is so even when we have to wait to see that worked out and just do what we can. Like Roo’s favorite colorful “Spots” from Put Me in the Zoo, we need to know we are special enough to be ourselves. No one can be just like you any way. We don’t have to figure everything else out first. We just do what we can. Why Go Fund Me Legal Aid? My Uncle Sam (yup, for real) created this Go Fund Me page – click here to help pay the attorney’s fees in this custody case. All of the money Sam raised has been used to pay legal fees, and our accounts with the lawyer and court appointed psychologist are still behind. It’s been so far behind that they warned us our hearing for Roo could be postponed. I wish I could tell you everything that has been done to drag this out and force us to pay more costs, in hopes that I will give up. One day, it will be over and I won’t be afraid to tell you so much more. I just can’t give up trying to safeguard Roo. – If you’ve read my uncle’s Go Fund Me updates, you know the court battle is being dragged out by opposing counsel who just got another 2 week delay for the 2nd half of June’s hearing (that I tried to get since January) – now set for mid-August. – We need your help with the legal battle by donating on the Go Fund Me page whenever you can. – You can also help by praying for Roo. He’s had some pretty severe setbacks over the past few months after a temporary order on private visitation. Roo is such a bright and loving boy. – Roo and I continue to live with extremely generous friends who’ve obviously become family to us. Our church and family members have also been extremely kind in providing compassionate support and helping pay legal bills. *Lines from “Just Like Fire” by Pink inspired me as I wrote this post weeks ago, but circumstances kept interrupting publishing. Please pray with me that I can publish again asap. “I will keep smiling most of the time; I’m not going to wait until the pain lets up. But, when RA makes things a misunderstood mess, I’ll reserve the right to cry too. If my eyes can manage it…” continue reading The Confusion of a Smile. “Meanwhile we must have a warrior’s intensity of focus that can’t easily be derailed. Warriors don’t give up – at least for very long. Living with a chronic illness wears you out. For some the disease itself is disabling, but its psychological toll can also seem immobilizing. Warriors fight on with our whole hearts. So, how to live like a warrior lesson one is…” continue reading How to Live Like a Warrior: 3 Lessons. Kelly, I am so sorry this is happening to you. It’s bad enough to battle RD, let alone all the other stressors. I am so glad that your Uncle did start the Go fund me page and provides updates and gentle reminders. You have helped so many and I know that it helps me to return some assistance. It’s not equal to all you have done for me with your RA Warrior but, I hope it helps. Keeping positive thoughts for you and Roo. mine is a professor at McMaster medical university and a good friend. God bless you both. You’re in my prayers. I will pray for you and Roo and yes you do have a right to cry. If I’d had to go through fighting a battle for my son along with RD I’ve no doubt that hurricane force of warrior battle strength would be necessary. 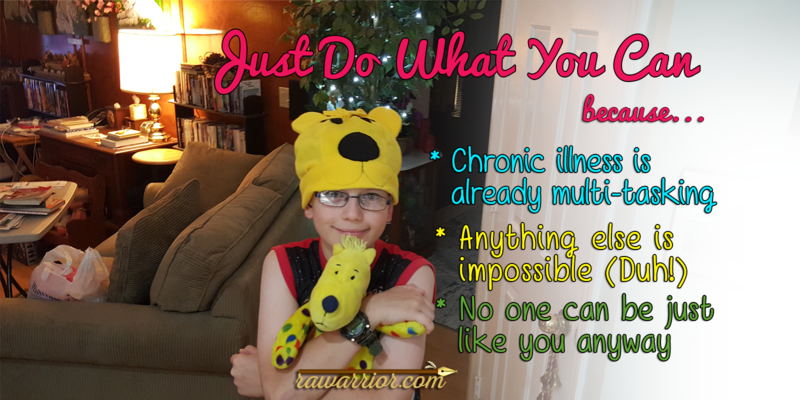 We warriors here know when the disease rears it’s ugly head there’s no stopping it for it does not ask permission to do whatever it wants to our body and mind. I pray for Hurricane Force Warrior Strength for you Kelly. On the harder days may you feel Jesus carry you until your ready to go again. You both shall remain in my prayers. Right now, our home computers are konking out on us without notice….so, connection could be stopped halfway through our attempt at donation……actually, our computers are fine, but Verizon can’ t fix their problem at their end…..so, we will be changing to a different system in a week, and we will send an online donation at that time….we don’t want to lose a connection midway in the donation process…..such a bummer! Just wanted to let you know that we’re thinking of you–always! (hope this gets through before the connection gets lost again!) Hugs! Kelly, My traumatic divorce when my children were 9,7, and 4 cosst me loss of my house, many of my possessions, my car and finally threw me into bankruptcy. Had it not been for friends from work, I could not have made it. My mother died a year later – of RA complications. Himself, at that time a dear friend, helped me more than I can say. I did not, at that time, have RA. I don’t know if I could have survived if I had had to deal with our VILE disease at the same time. My heart is going out to you. I was attacked by my ex-h on every side. I lost my church and most of my friends – because they went to my church. [He went through 2 more wives and another woman before he died in 2015.] We lived like paupers for 2 years. After Momma died, I accessed enough money to make the down payment on a house. But the RA was raising it’s ugly head. This was in the 70’s. Nothing available for treatment except pred. I was sero-negative, and couldn’t get treatment at that time. It was nearly 30 years later that I converted to a positive RA factor. All this is to say, I know much of what you are going through, and I believe I understand most of the rest. If there is ANYTHING I can do, please let me know. Living 800 miles from you limits me, but I could do little things – find articles about RA in medical journals, etc. I’m sure you have your own sources, but maybe I can find some relevant items for you. You know your Blog Carnivals? What about a carnival of articles for RAWarrior? That might help keep RAWarrior going when you are otherwise occupied with legal or medical issues. Just a few ideas that might help. You KNOW my prayers are with you, and that our love for you is with you, also. When you are just sure you can’t do anything more, let yourself take one or two or five “down” days and recover. And let your fellow warriors help out. Your love means so much to us Elizabeth. I know I’ve shared some with you, but I wish I could write about everything that’s happened, maybe someday, I believe it would help others. I worry about what I write down publicly for many reasons such as my kids’ future privacy. We have a lot in common. As you know I’ve only had pred or advil to help me either because nothing else helps. Other things I’ve tried just make things worse. And no “flares” since 2006 – just 24-7 worsening rd in every joint. So ridiculous you can only try to laugh. I can’t “handle” it either as you say – I am trying to survive it. It means so much to know I have friends like you because I have lost so much to try and help Roo. Funny you’d mention church – I’m thinking about a blog post relating to that. We have our own church of course, but isn’t the church in general strange on this issue of abuse? Feel free to let me know if you have article links – at least I can use them on FB if I don’t have time to write posts about them all. But I’m trying to do some. I just feel that i have to write this post. I was diagnosed approx. 15 yrs ago with RA. I have used omega XL for at least 6 years which worked well for me, until i started getting palpitations, then i had to stop taking it. I am so afraid of all the serious side effect that RA drugs cause, i will not take them. Oh my doctor prescribe them, i just would not take it;trust me i had the morning stiffness, joint swelling and pain for which i used Motrin 600mgs daily,my doctor wants me to take it three times a day. Misunderstood mess – how true! Exhausted of trying to explain it all – I think we all have bigger fish to fry especially you Kelly. Prayers for you and Roo. Prayers for you and your family. RA is enough, on its own. I have been diagnosed with RA for about 4 years. Of course, I probably had it longer but it took until then for all the tests to tell the doctors that it wasn’t “womens” issues…I see my RA doc every 4 months. I am on my 5th biologic drug….and it’s not working, but I’m not giving up. Never give up. Thanks Carol. You’re right – we must not give up.